Chemotherapy is able to target and eliminate most cancers very effectively. The goal of chemotherapy is to destroy cancer cells. So it targets fast dividing cancer cells; but healthy cells also get damaged in the process. It is when the healthy cells get damaged that you start to experience side effects. It can lead to side effects like fatigue and infection. When the cells lining the mucous membranes throughout the body are damaged, it causes mouth sores, diarrhea or other issues with the digestive system. And damage to cells at the hair roots, or follicles, can lead to hair loss. These are just few of the commonly reported side effects. As stated earlier, individuals react differently to chemotherapy. There are dozens of other side effects that you might experience as a result of chemo. But today, thanks to progress made in medical science, chemotherapy has become much more bearable as doctors have found ways to treat or manage the side effects arising due to the treatment. Of the people who underwent chemotherapy, 75% of them reported experiencing fatigue as a side effect. For many people, this constant state of tiredness prevented them from being able to carry out day to day activities. If you experience fatigue, talk to your doctor about it and what medicines can be taken to counter it. Since there are many and varied reasons for fatigue, there isn’t any one medicine that can be administered to everyone. The doctor needs to know the specifications of your condition to prescribe the right medicine. There are complementary therapies you can try out. Alternative medicine practices like yoga, acupuncture, massage, acupressure and meditation have been beneficial for some people in dealing with fatigue. Bringing about a change in your lifestyle can also help you. American Cancer Society recommends 1 hour of exercise for 4 days a week. Start off with 15 minutes a day and then gradually increase your time to 1 hour. It might be difficult to exercise when you are feeling so tired all the time, but you do not have to start with bench presses. You can go for a walk with a friend or just play with your dog. Exercising will improve your blood circulation and make your body more active. Eating the right kind of food will help provide you with the nutrition your body needs. To fight fatigue, it is imperative that you get sufficient amounts of proteins and calories. Also ensure to get enough vitamins and minerals, preferably from food rather than supplements. Other things you can try include taking a 20 -30 minute nap during the day, sticking to your routine and joining a support group. 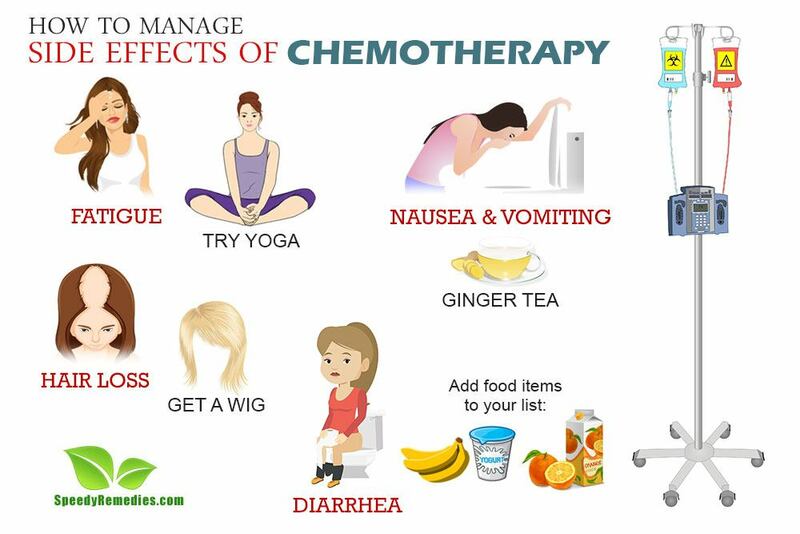 Losing hair is another common side effect of chemotherapy. It can be mentally upsetting to lose so much hair suddenly, especially for women. While it is not possible to stop the hair loss completely, you can try and manage it. Use a gentle shampoo while washing your hair and set your dryer on low heat when drying it. Cut your hair short. It might be less unsettling to lose short hair and it will also give you an idea of how your hair will look like once it starts growing back. Find a wig specialist to get your wig made. You can try different styles, experiment with colors or just have it made like your natural hair. Ask advice from wig salons about taking care of the wig – shampoos, conditioner, brushes etc. You can also go for multiple wigs so you have a different hairstyle according to your mood or occasion. Use hair accessories like hats, caps, turbans and scarves to try out different fashion styles on your head. They are affordable and can be used on a variety of occasions. Nausea and vomiting are extremely common side effects of chemotherapy with 60 – 90% of the people who underwent treatment reporting it. Nausea is a sick feeling in your stomach that makes you feel like you have to vomit. Mild nausea can cause loss of appetite. Moderate to severe nausea usually causes some degree of vomiting. It may or may not accompany vomiting. Vomiting is when your stomach throws up its contents out via the esophagus. It is usually the result of nausea. To manage these effects, there are anti-nausea drugs available that can be taken either before or after the treatment. Most people experience relief for the first 24 hours after chemotherapy and about 45% for the first five to seven days of treatment. Try eating ginger. The spicy bite of ginger may also help manage nausea and vomiting, reports the National Cancer Institute. Ginger ale, ginger tea, or crystallized ginger are some of the ways you can take in ginger. Do not eat greasy foods as they can upset your stomach. Instead, go for dry and bland foods like toast, plain rice and cereal, eating them in small quantities through the day. Rinse your mouth after a meal to get rid of any taste that might make you feel nauseous. Also, don’t lie down after eating as it may make you vomit. Keep sitting up for about 30 minutes after eating. Drink lots of liquids like broth, juice, flat soda pop, sports drinks, and water. This will make up for the loss from vomiting and keep you hydrated. If a bad taste persists in your mouth and makes you nauseous, try sucking on a peppermint candy. Diarrhea occurs when the water in your intestine does not get absorbed back in your body. It leads to loose, watery stools about thrice a day. It can also be accompanied by nausea, bloating and cramps. Give your body small, frequent meals as smaller amounts of food maybe easier to digest. During the starting stage of diarrhea, go for a clear, liquid diet consisting of water, weak herbal tea, apple juice, clear broth, frozen pops, or plain gelatin. These liquids will prevent over exertion by your bowels and help prevent irritation. Your diet should include foods that are high in pectin, potassium, sodium and protein. Pectin is a water soluble fiber that helps control loose motions. Potassium is often lost during diarrhea. Salt helps retains water and protein helps you fight fatigue. While you need to add the above mentioned food items to your diet, there are some food categories that you need to avoid as they can make your diarrhea worse. Caffeine, tobacco, extremely hot or cold foods, alcohol, chewing gum or carbonated beverages as they irritate your digestive tract. Food with high fat content or food that is fried and greasy as they cause loose motions. Limit milk and milk products as they are hard to digest. Stay away from nuts, raw fruits and vegetables, whole-grain breads, and bran products as they can harm your digestive tract. It is obvious that the stress and shock involved in the treatment can affect your weight. Some people lose while others gain weight. It does not matter if you lose or gain a few pounds. But if your weight change is drastic, like 5 -10 % of your body weight, then it’s something that can affect your health. Weight changes can be due to many reasons. Sometimes, it could be the result of the medications you are taking, like pain medications or steroids. Eat a balanced and healthy diet that comprises of vegetables, fruits and whole grains. Eat small quantities of food throughout the day to keep your metabolism working and avoid sudden hunger pangs. Try to eat snacks that are high in protein content and low on fat. Protein will provide you energy, fight off fatigue and prevent you from eating sugary foods. Limit your intake of sugar, alcohol and saturated fats. Use low fat milk instead of water in cooking when possible. Exercise regularly, at least 3 hours of moderate exercise a week. It helps keep you body active and is an integral part of a healthy lifestyle. Dealing with cancer and the side effects reeling from chemotherapy can be a tough ordeal. It is hard and punishing but it is important that you don’t give into despair and negativity. You need to strengthen your resolve and fight it by making your body and mind stronger. Open up to your loved ones, join a support group and consult with you doctors about how you can manage these effects and go through the treatment with a better mindset and positive outlook.